Visitors at the Science Museum need to think a little bit now before throwing out their trash. 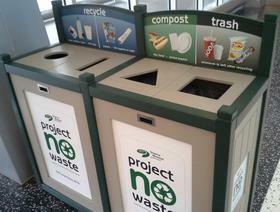 Project No waste requires more specific sorting of wastes throughout the building. For more than two years, the Science Museum of Minnesota has made efforts to reduce the amount of garbage it sends into landfills through a program called Project Now Waste. Museum visitors and employees are now asked to sort out their wastes as they throw them away, putting things into specific bins for compostables, recyclables and trash. The project also called for having much more signage explaining about which wastes need to go into which bins. When the project started in April 2011, the museum was only recycling or composting 18 percent of its wastes. As of August 2013, the museum is now recycling or composting 75 percent of its wastes. Half of the museum's wastes are now being composted. Here is more information on SMM's Project No Waste.